Unlike many TV series, Dexter isn’t in danger of being cancelled this year. In November, Showtime renewed the drama for both seasons seven and eight. Will there be a ninth season? That remains to be seen. The seventh season of Dexter airs on Sunday nights and there are 12 episodes. The cast includes Michael C. Hall, Jennifer Carpenter, C.S. Lee, Lauren Vélez, David Zayas, and James Remar. Below are the most recent ratings for Dexter on Showtime. The TV show’s ratings are (usually) the best way to tell if a series will be cancelled or renewed for another season. Final season averages: 1.1 rating in the 18-49 demographic with 2.23 million total viewers. 1.4 demo rating (+8% change) with 2.75 million (+6% change). Season averages: 1.14 in the demo with 2.23 million. 1.3 demo rating (+18% change) with 2.60 million (+20% change). Season averages: 1.12 in the demo with 2.18 million. 1.1 demo rating (+10% change) with 2.08 million (-2% change). Season averages: 1.10 in the demo with 2.14 million. 1.0 demo rating (-9% change) with 2.12 million (-6% change). Season averages: 1.10 in the demo with 2.15 million. 1.1 demo rating (0% change) with 2.25 million (+11% change). Season averages: 1.11 in the demo with 2.15 million. 1.1 demo rating (+10% change) with 2.01 million (+1% change). Season averages: 1.11 in the demo with 2.13 million. 1.0 demo rating (-17% change) with 1.99 million (-15% change). Season averages: 1.12 in the demo with 2.15 million. 1.2 demo rating (+9% change) with 2.28 million (+4% change). Season averages: 1.14 in the demo with 2.19 million. 1.1 demo rating (+10% change) with 2.18 million (+9% change). Season averages: 1.13 in the demo with 2.17 million. 1.0 demo rating (-9% change) with 1.98 million (-6% change). Season averages: 1.13 in the demo with 2.16 million. 1.1 demo rating (-15% change) with 2.10 million (-14% change). Season averages: 1.20 in the demo with 2.25 million. 1.3 rating in the 18-49 demographic with 2.40 million total viewers. Season average: 1.30 in the demo with 2.40 million. It was a big opening for Dexter. Year-to-year, the premiere was up by 18% in the demo (vs a 1.1 rating) and up by 9% in viewership (vs 2.19 million). Reference point: The sixth season of Dexter averaged a 0.9 rating in the 18-49 demographic with 1.92 million viewers. What do you think? Do you still like the Dexter TV series? Do you think it should be renewed for a ninth season or cancelled instead? The 8th season is it’s last. They say that they haven’t decided that yet. Over the weekend, Showtime Entertainment President David Nevins said they haven’t decided yet if season eight will be the end. It jumped the shark last season. It was a horrible story line, they should have kept the Luman character. It used to be a great show, but it fell apart . Showtime should pick up Breaking Bad, AMC got rid of the best show ever. 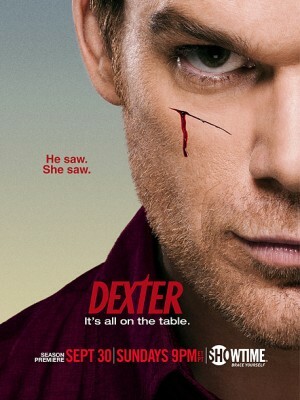 Glad we have two more seasons of Dexter to look forward to! I love this show have been watching since episode 1. I’m sad that next season will be the last one. Probably won’t watch ShowTime anymore once the series finale happens next yet. Easily the best show on TV, the writing is amazingly intricate, the acting is brilliant and believable, and the music fits very well to weave it all into one fantastic package. Not to mention the current season that is airing is becoming one of their best to date. I never miss an episode of Dexter! Love my Dexter! I think he should run as long as they can keep on writing about him and keep it exciting! Dexter Lover!!!! Michael C.Hall as Dexter and Jennifer Carpenter as Deb are brilliant, as always. This season is well written and superbly acted. This show is a must see and should definitely be renewed. Renewed definetely! Its the most exciting show on tv right now. Gotta love Dexter! And Michael C.Hall is amazing!